Time and time again, I often repeat my frustration with the culinary wonder known as "Pizza". I love those glorious oven baked pies, but more often than not, it triggers my hyper acidity,and the results aren't pleasant. As much as I would love to be able to indulge in a stunning, thin crust pizza, topped with a double helping of mozzarella cheese and bacon, ham, and pepperoni, I would never do so at the expense of possibly having a brown baby boy in the middle of an important meeting. Which is why It took me so long to visit Nolita. 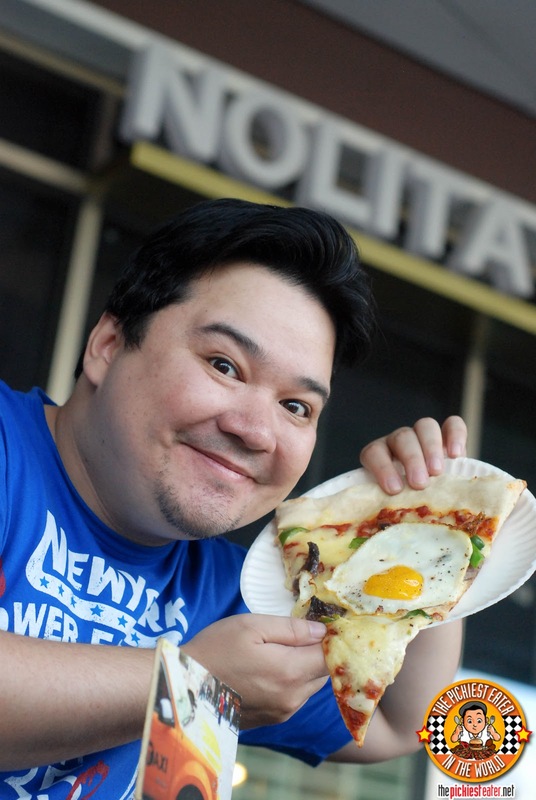 A couple of months ago, as I made plans to meet up with my college friends, I suggested to my friends that we check out Nolita, thinking that I could taste one of their pizzas and realize that it wasn't something I would crave for, and my tummy would not be in jeopardy. Basically get the whole thing over with. As my teeth dug into my pizza, the first thing that came into my mind was, "Uh-oh". Apparently, my reverse psychology technique didn't work, but more on that later. 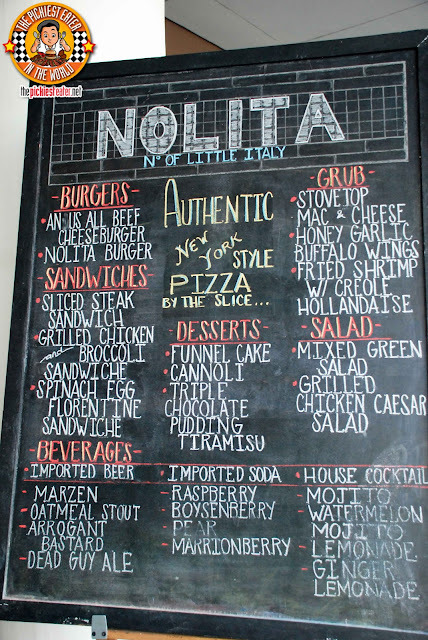 Nolita is short for "North Of Little Italy", a section in the city of New York that got its name from the influx of Italian immigrants into the neighborhood. Though the specialty of Nolita in Bonifacio High Street Central is New York Style Pizza, It was nice to see that they also offered some good old fashioned American favorites, such as Burgers and Mac and Cheese. The restaurant is a hip little place, that has a cool, industrial look, yet is peppered with homey picnic tables, giving it a very casual vibe. 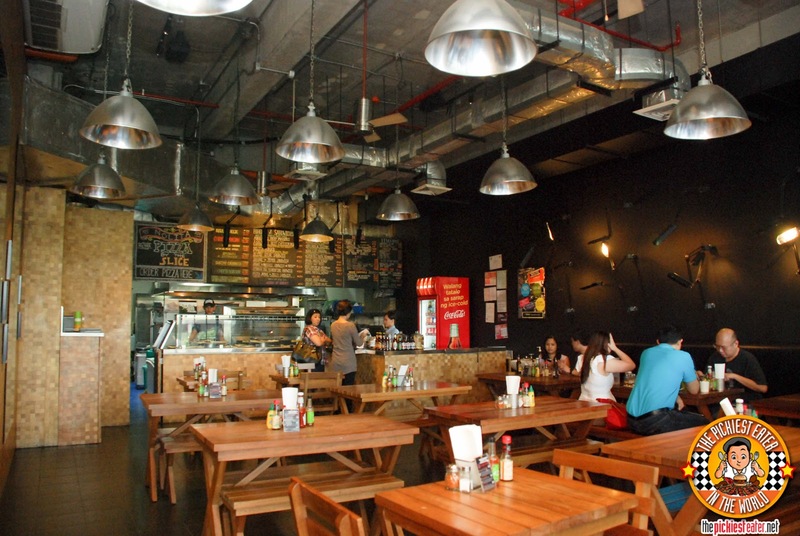 You order cafeteria Style, with a dazzling array of pizzas on display for you to choose from. I guarantee all first-timers, as you stand in line, choosing only ONE of the pizzas will feel like a near impossibility. 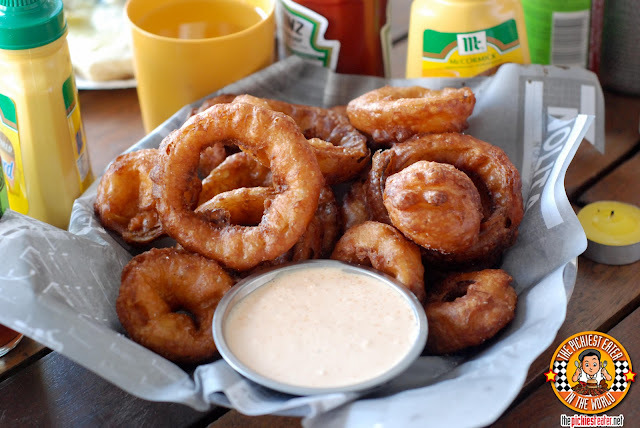 We started our meal with an order of Nolita's Beer Battered Onion Rings (P130). This was pretty fantastic. The coating was a little thick, but so full of flavor, having a touch of heat in it, which perfectly complimented the sweetness of the onion. Add a creamy yet zesty dip on the side was the cherry on top! When I told some friends I'd be going to Nolita, most of the said to try the Spinach & Artichoke Pizza (P210), which wasn't going to happen, considering I don't eat the two ingredients stated in its name. However my friend Karen decided to give it a try, and after her first bite, she was adamant that I taste it as well. Considering it was a white sauce based pizza, I decided what the hell. Topped off with Ricotta Cheese and a drizzling of pesto sauce, this pizza was actually quite tasty, and I was pleasantly surprised that I liked it. The beautiful creaminess of the cheese, and the soft punch of the pesto made me almost forget there was no meat in it. I wasn't too fond of the Buffalo Chicken with Blue Cheese Pizza (P250) that my friend Krystal ordered. Considering I don't like Buffalo Style wings in the first place, that didn't come to much of a surprise. I don't know about you guys, but doesn't blue cheese taste.. ummm... Rotten? I prefer my cheese rich and creamy, maybe with a bit of sharpness is fine. But mold? No thanks. I'm curious about the dude that discovered blue cheese. Was he drunk out of his mind when he opened up his ref, plucked out a hunk of cheese, saw some mold on it, yelled out "YOLO! ", then plowed his mouth into it? When woke up a few hours later, he probably said, "Damn, that was actually pretty good". Because no matter how much I didn't like the pizza, I found myself in the minority, because everyone else seemed to love it. Rina said the tangy acid on the chicken chunks, went well with the pungent flavor of the cheese. Let's just say she didn't get a good night kiss from me until she brushed her teeth hehe. 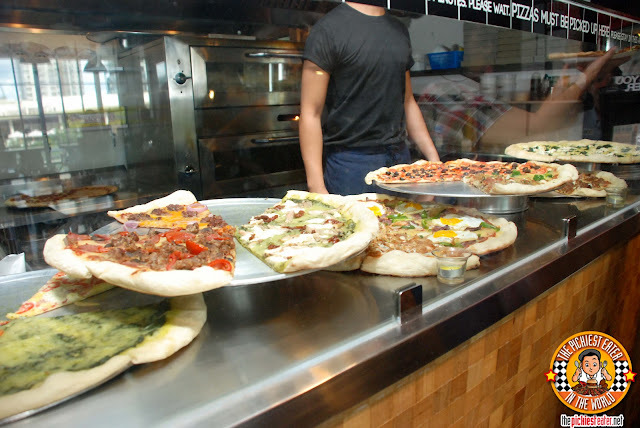 Because they make their pizzas fresh daily, going to Nolita could be a bit of a crap shoot. You're never guaranteed that the flavor you're looking for will be available that day. 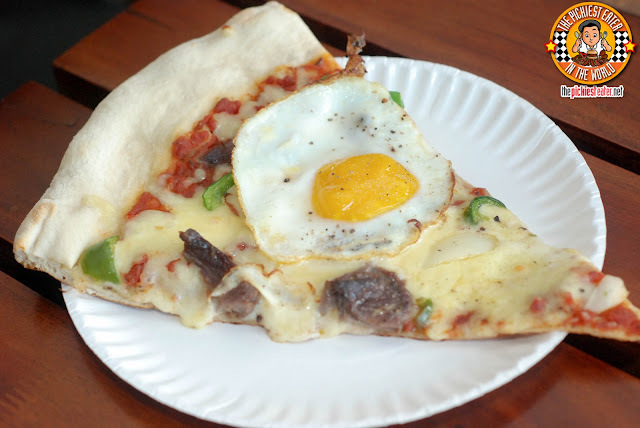 I had heard about the Steak and Eggs Pizza, so that's what I had my sights set on. And the Pizza god's smiled at me that day, because, lo and behold, it was available. I would have preferred a more generous helping of "steak" in my pizza, but the beef bits had a nice meaty flavor to it, that served as a great protein for my pizza. Though it was tomato based, the creaminess of the fried egg helped temper the acid of the red sauce. The other veggies in the pizza, onions and green peppers, were pretty much standard to a pizza, so it was no biggie for me. All in all though, It was a very good pizza, in fact, one of the best I've had in the Philippines. 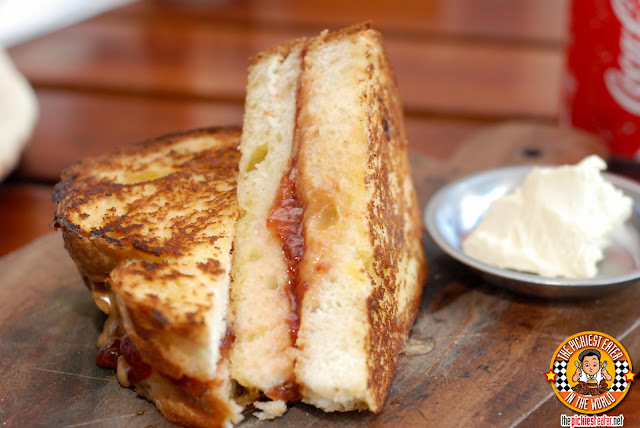 There was something about reading "Fried Peanut Butter & Jelly Sandwich" (P250) on the menu that just made perfect sense for me. I felt I would regret it if I didn't give it a chance, and thankfully, I was right. Made with Nolita's home made peanut butter and Strawberry Jelly (Also Available in Grape Flavor), this sandwich brought me back to a simpler time, when I was a child and my yaya would make me merienda before starting my afternoon session with my math tutor (Hi Mrs. Japzon!) The brioche was moist and buttery, and if that wasn't enough, the served a side of creamy butter for you to dab, or in my case, slather your sandwich in. With enough room outside for Baby Rain to run around in! I can't speak for her, but i know I sure was! 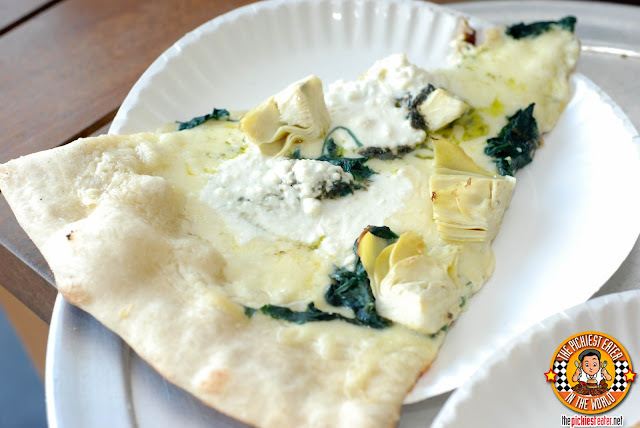 Definitely heading over: the spinach and artichoke pizza's singing to me...! hmmmmm mac and cheeseeee....., drool!!! my friend swears its fantastic! 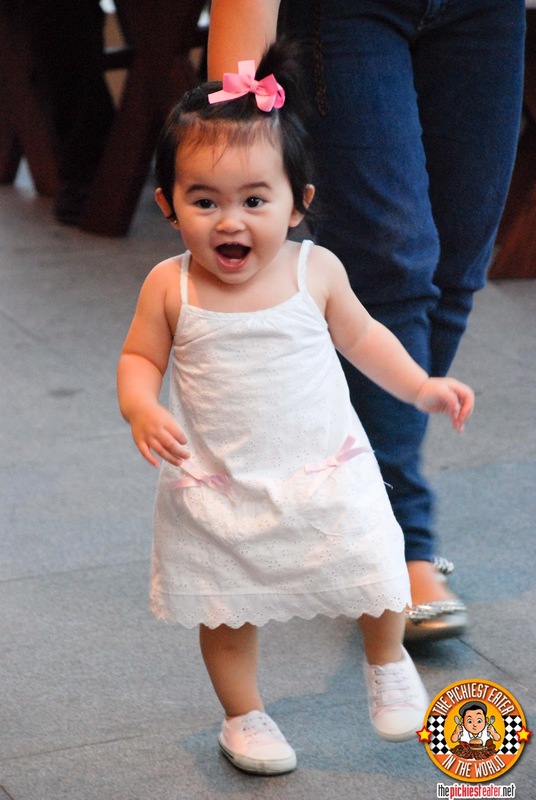 Hi Richie! 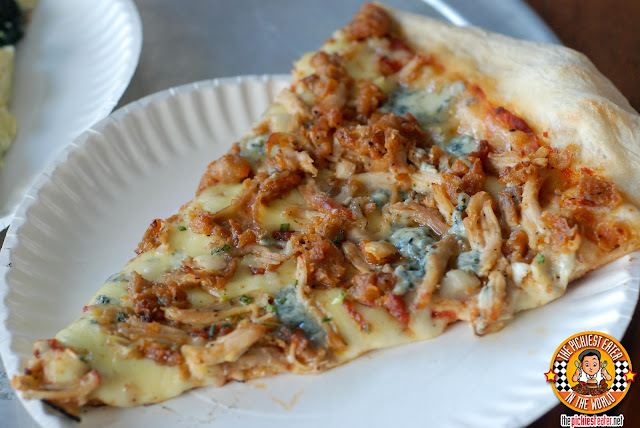 Reading this pizza post at 5am is making my tummy growl! :D I digress... Ive read a lot of ur posts where you complain abt ur hyperacidity hindering you from trying out tomato-based food. There are certain kinds of meds you can take bfore eating that can counteract hyperacidity... consult a gastro doctor for this. 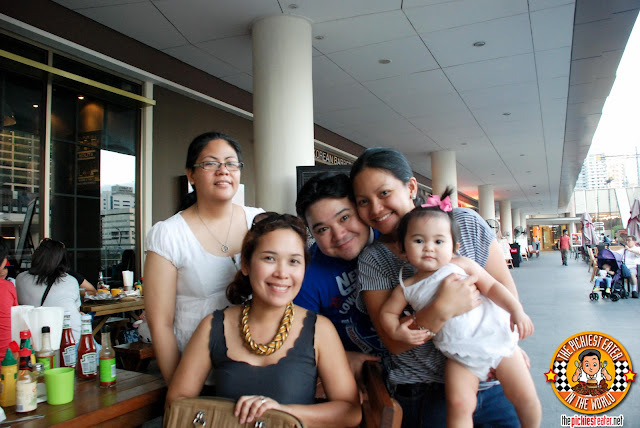 Sayang kasi there are lots of tomato-based food that are really good!